1. Use a screen bottom board. 2. Powdered sugar dusting can help some. 3. Green drone comb trapping. 4. Breaking the queens brood cycle. 5. Mild acids if necessary. Beekeepers are concerned about toxic seed coatings and other crop chemicals harming honey bees. But the fact is, even if we could halt all chemical use honey bees would still be in trouble due to the varroa mite. Today I want to educate you on the varroa mite and provide you with detailed information on how you can use a new technique to reduce your mite population in your hives. If you do nothing, you will greatly increase your risk of losing your hive. To have a strong colony, one that overwinters well and makes honey, you MUST control varroa mites. But do not become discouraged or defeated by this honey bee parasite. We can keep healthy bees even with varroa mites. Mites are everywhere in our world. There are many approaches to dealing with mites. But for you to be a successful beekeeper, you need to be well informed about Varroa destructor. The varroa mite was first introduced into our country in 1987, although the literature identifies the spotting of one varroa mite in Maryland in 1979. Since 1987 mites have spread rapidly throughout the US. The mite was first identified as Varroa Jacobsoni but later correctly identified as Varroa destructor (Anderson and Trueman 2000). It is the number one killer of honey bees in the US. As an ectoparasite (lives outside of the honey bee) it is one of the largest parasite on the planet compare to its host. It is not a natural parasite to our honey bee, Apis mellifera. Its original host was Apis cerana. But, like many pests, it jumped species and Apis mellifera was not able to cope well and most feral colonies, wild hives, were destroyed by the mites in the early 1990s. Varroa mites are tiny but visible with the naked eye. In this photo, I pulled out a drone pupa and you can see the tiny mite on the lower abdomen of the drone. The mites that we see on our bees are the adult, female mites also called the foundress mite. These adult females are dark, reddish brown in color. Male mites are rarely seen outside the cell and they never turn dark but remain white or a light color. Mites only reproduce in the sealed cells of a bee hive, never outside the hive. 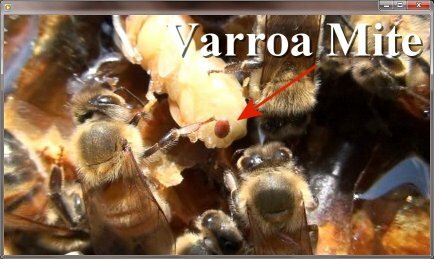 The varroa mite enters a hive through the front entrance, riding on other bees. Drones are allowed to enter any hive and drones are common carriers of mites, transferring them from hive to hive. Once in the hive, the adult foundress mite will look for a young nurse bee and climb on her back and will latch on to the thorax where the wings attach or just behind the head. Mites feed on bee blood, known as hemolymph. Because the bee is exoskeleton, the mite cannot penetrate the outer plates of the bee so it moves to the overlapping segments of the abdomen to the soft tissues and pierces through with its mouth parts. These areas on the honey bee are known as the intersegmental membranes. When the bee larva is around 8 days old it gives off a distinct pheromone signal to adult bees to seal the cell. However, that same pheromone signal is picked up by the varroa mite as an indication that it is time to enter the cell. The mite makes her way into the bottom of the cell and buries herself beneath the royal jelly in the base of a cell. Mites have a snorkel like apparatus that they use to breathe while hiding under the royal jelly. These specialized tubes are called peritremes and are thin, pale-colored tubes located just between the last two pairs of legs. Once the cell is capped and the bee larva has spun its cocoon the mite will feed on the larva and will begin laying eggs about 3 days after the cell is capped. Most female mites lay between 4-6 eggs, the first being a male mite, and the remaining 4 being females that mate with their one brother in the cell. Unlike bees, mites do not go through larva and pupa stages, instead they go through 4 developmental stages: egg, protonymph and deutonymph stages and finally adult. From egg to adult takes 6-7 days for females and 5-6 for males. Mites will pierce an opening in the prepupa honey bee larva and the whole family of mites will feed from that one wound. As the family grows and the bee emerges, the foundress mite will leave the cell with one or more new female daughters. The males die and never leave the cell and the bees clean them out. The adult females will then attach to adult bees for an average of 7 days before finding a new cell to enter and reproduce again. During her lifetime the foundress mite will go through 3 reproductive cycles. Once you understand the brood cycle mites, you will have the information needed to apply this new technique. BREAK THE BEES' BROOD CYCLE & THEREBY BREAK THE MITES' BROOD CYCLE. Since we do not use chemicals in our operation, we use many approaches to reduce mites such as screen bottom boards, green drone comb trapping, and sugar dusting. Another effective method is to break the bees' own brood cycle. Stop the queen from laying and you've stopped the foundress mites from reproducing. Without bee brood, mites can no longer multiply. Let me go into detail how to break the brood cycle. 1. Remove the queen from the hive any time after June 21st. The month of July is a great time to implement this technique because mites become a real problem August through October. Replacing the queen in July accomplishes two objectives: 1) You will have your full foraging force for the year's crop so you can afford to go without a queen for two or three weeks and 2) Your old, overwintered queen will slow down laying after June 21st allowing the mites to reproducer faster than bees. Therefore it is a good time to introduce a new queen but to wait two or three weeks between queens. 2. After removing your queen wait two or three weeks then introduce a new queen. You will need to tear out queen cells that will develop. If you allow these cells to mature, you run the risk of the queen not properly mating, especially late in the year when there are fewer drones. The new queen should lay like a spring queen. These new bees will go into winter without being parasitized by mites. When you break the brood cycle for longer than two weeks you increase your chance for laying workers to become a problem. 3. Introduce your new, mated queen with a full candy plug, giving the current colony time to accept the new queen. A marsh mellow can be used to plug used queen cages. Carefully plan and be sure you can secure a new queen before removing your old queen. 4. By breaking the brood cycle you greatly reduce future mites at a critical time of the year, going into winter. However, this will not reduce all mites. The following addition step can also eliminate more mites. On the same day you pull out your queen, introduce a green, drone comb that has already been drawn out and has eggs or young larvae. The adult mites will enter into these cells and can be pulled then frozen when drone cells are sealed. Pull your queen, let's say on July 10th and place in a green drone comb full of uncapped larva. (The green drone comb step is not essential if you cannot utilize it). This can be prepared in a second hive or the current hive if timed right. The hive remains queenless from July 10-July 25. Remove queen cells on July 20th and introduce a newly mated queen into the colony on July 25th. Again, do not speed up her coming out of the cage. Do not poke a hole in the candy. Breaking the brood cycle along with other IPM methods can greatly decrease the number of mites in your hive.